CNP fraud and payments has always been complex. In an age of constant data breaches, rising fraud, and consumers demanding seamless, convenient shopping experiences on any device, the universe of companies providing solutions for these business problems is exploding. Merchants with limited time don't always have the resources to find the providers who best meet their digital fraud prevention and payments facilitation needs. 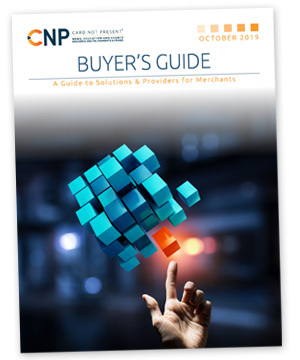 That's where we come in... Get our FREE CNP Buyer's Guide to learn which solution providers can help you navigate the e-commerce and m-commerce payments and fraud ecosystems. Fill out the form to the right to get your CNP Buyer's Guide.